We all have our cooking hang-ups. You know, those techniques we can’t master, those ingredients that we just can’t figure out how to cook right (eggplant–do I leave the skin on or off? Seriously. ), that vocabulary that all runs together (it’s not like we went to cooking school; why aren’t definitions attached to every French word??). These hang-ups dictate what we cook or don’t cook, what we’re willing to bake and what we shy away from. I’m not saying we don’t try and try and try again to figure out how to master whatever the bane of the kitchen is, but it’s frustrating and, personally, I feel like I fail every time. Now, brunch/breakfast is my favorite meal. It’s also the poet’s. So I feel like I need to come up with something tasty and innovative every now and then. And who doesn’t love a good pancake?! They’re carby and filling and can be made with lots of different twists. So here’s where the hang-up comes in: I can’t flip a pancake if my life depends on it. Remember that crepe cake? (I can’t post a link, it was deleted with my first blog.) I think I had 20something crepes in it. You know how long that took me?? FIVE hours. FIVE HOURS for TWENTYsomething crepes. And that was all because I couldn’t flip them. Fail. Well, I’d like to announce that thanks to the twenty-step pancake flipping anxiety program, I think I’ve mastered my hang-up. I can now flip with confidence! 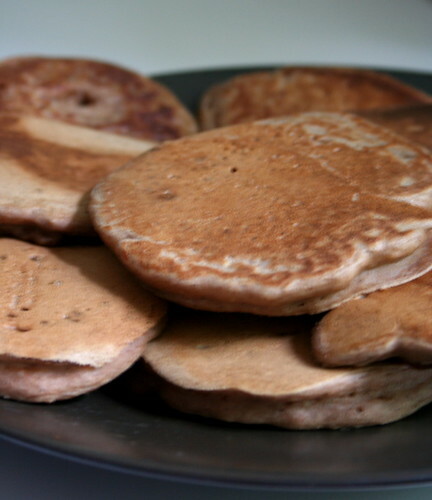 No, really, I just figured out how to flip pancakes. I’ve been trying for…oh…ten years or so now. Practice makes perfect, I guess. Look at that stack! So, whatever your food hang-up is, don’t give up. Keep flipping. Or grilling. Or sauteeing. Or using that damned eggplant. I still can’t hang with pancake flipping! At least it makes for an interesting look, haha.Oh btw, not sure if Jared (jerks on bikes blog) e-mailed you yet, but he’s putting together a team for the F.M. 24 race (http://24.fastermustache.org/) coming up in a little less than two weeks and we wanted to know if you planned on participating and if so would you be interested in joining our all vegan racing team! Hit me up if sounds like something you’d be up for!!! Kittee approved, and shellyfish approved, too! I totally have some eggplant in my fridge that I’ve been avoiding… I think you’ve given me the courage to get it out! Yay for mad pancake flipping skills! I don’t think I’ve mastered my pancake flipping skills yet either. 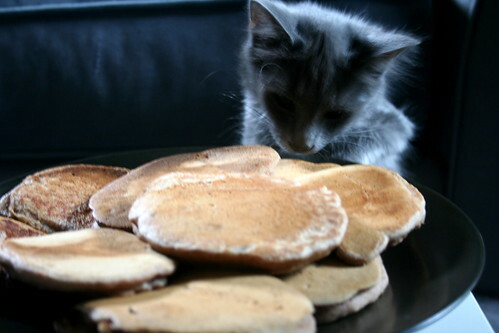 Pancakes are just too tasty to give up trying though, kudos to you!